Dozens of military aircraft took to the skies yesterday (Tuesday) for their final rehearsals ahead of the flypast over London next week to mark the centenary of the RAF. 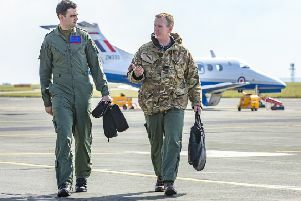 The rehearsals took place at RAF Cranwell, near Sleaford, yesterday afternoon ahead of the main event in London next Tuesday (July 10). Around 100 aircraft, including Dakota, Spitfire, Lancaster, Hurricane and the Red Arrows, will fly over The Mall on the day. Meanwhile, a parade of more than 1,300 servicemen and women will take place on the ground below.